Home »Comics»Deadshirt is Reading: Sixpack, New Avengers, and Snotgirl! 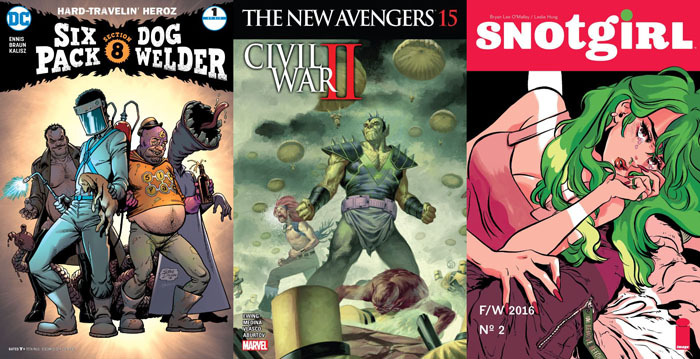 Deadshirt is Reading: Sixpack, New Avengers, and Snotgirl! Garth Ennis’ somewhat inexplicable return to the world of Hitman—here in the year of our lord 2016!—continues with a new mini-series once again centered on the not-so-super heroes that make up Section Eight. Hard Travelin’ Heroz pretty much picks up where All-Star Section 8 left off, with the puke and beer soaked Sixpack once again unsuccessfully trying to rally his team against pretend threats to the DC Universe. Only this time, Sixpack and co. are actually facing off with a threat so massive that The Spectre shows his face. Ennis is joined on this mini-series by his The Boys and Battlefields collaborator Russ Braun. While it’s always a shame to see Ennis working with anyone but McCrea on a Hitman-related comic, Braun’s work here is outstanding. Braun’s heavy pencils give the book an appropriately gritty, animated vibe while returning colorist John Kalisz’s palette choices help create strong visual continuity between the two Section Eight mini-series. In terms of story, there isn’t much to this issue. If you enjoy the characters and Ennis’ signature brand of crude humor, you’ll dig on gags like Catwoman sexually harassing Baytor or Sixpack completely missing the point of the O’Neil/Adams Green Arrow/Green Lantern run. Really the best part of the issue is the crumbs Ennis lays down as to the origin of the enigmatic Dogwelder, now possessing an innocent man’s body and ruining his life in the process. Dogwelder isn’t exactly a character that needs any backstory but the promise of Ennis writing another John Constantine adventure is tantalizing. Your mileage may vary, but Hard Travelin’ Heroz is a solid first step in what is sure to be an uneasy, vomit-inducing stumble through Ennis’ depraved pocked reality of the DC Universe. It’s entirely possible, maybe even likely, that I’ve written more words about Al Ewing’s comics than about any other creator. At least once a month, I find myself discussing one of his various Marvel books, usually with a focus on the broad arcs. I’m going to eschew that approach this time to focus on a couple very specific things I like about this specific issue. It’s an issue full of moments, the kind of bombastic stuff that has defined this book. Sunspot wearing Warlock as armor! Toni cutting Skar’s head off! The hilariously designed Total Annihilation Drone! But the best part is the cut back through previous issues, to the small moments that were happening behind the scenes all along. A couple pages in, a rogue faction of S.H.I.E.L.D. fires a giant nuke at A.I.M.’s base—only it’s actually being fired at W.H.I.S.P.E.R. HQ. The narration jokingly tells you to jump back a few pages and see for yourself. Next, though, the book itself takes that very advice, looping back through a couple key conversations from this arc and revealing the coded spy conversations that Sunspot and his team were planning. It’s a clever way of framing, like a down-to-earth version of “Ultra Comics” from Multiversity. Speaking of behind the scenes, I’m not 100% sure that I buy Toni Ho falling in love with Aikku, the pilot encased within Pod. It’s not an unbelievable beat, but it came up sort of quickly, without a ton of foundation. I will say though that this issue’s development, that Pod sacrificed herself so Aikku could live, is heartbreaking and real. While some of it is clearly setting up for USAvengers, Medina and Velasco’s rendering of that moment more than sold me on the whole relationship, and I’m interested to see where it goes next. Like I said, New Avengers is winding down, the larger meta-arc Ewing has constructed out of tie-ins repositioning characters for his next book. I’m excited to see how this ends and that begins, but I was glad to take a week and just revel in the craft involved in a single issue. The snot thickens! Snotgirl #2 picks up with fashion blogger Lottie Person the morning after her friend Caroline’s brains ended up bashed on a bathroom floor—or did they? Lottie expects the police to bang on her door any second, but they never come; considering she doesn’t even remember how she got home, Lottie isn’t sure what to believe. As if a murder mystery wasn’t enough drama, Lottie also learns that her ex’s new girlfriend is her former intern, a plain jane looking to All About Eve Lottie’s life. Fasten your seatbelt, Lottie, it’s going to be a bumpy night. I adore every page of this comic. In just two issues Leslie Hung has become one of the most fashion-relevant comic artists working right now, and hopefully Snotgirl will be as star-making for its co-creator as Saga was for Fiona Staples. Lottie Person may not be the most relatable character (reading an article about a murder in a nail salon reminds her to give herself a manicure, natch), but Hung makes us feel her anxiety with every tense, nail-biting close-up. Murder never looked so cute.